It's my lovely young nephews birthday next week, so have used the sketch from the Bee Crafty challenge number 11 as my inspiration. 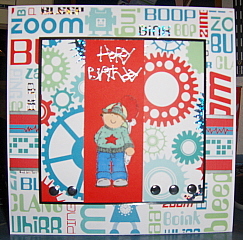 I used a selection of fabulous "Blips and Bleeps" papers (purchased very recently from Bee Crafty's wonderful new shop in Bidford upon Avon) which were matted and layered onto basic white 8 x 8 card stock with 3D foam. I then stamped the image of the little boy onto white card and used co-ordinating ProMarker pens to colour the image in. The stamp came free with issue 80 of Simply Cards and Papercraft. Those who know me, will know I am not much of a stamper but I was really pleased with the result. I then cut out the stamped image, attached it to a piece of red card and matted it onto the main card. A silver Happy Birthday sentiment and some silver card candy were then used to complete the the card - funny how I don't seem to be able to make a card without card candy now! Hope my nephew likes it! Also just realised that with the exception of the free stamp, everything single item used to make this card was purchased from from Bee Crafty. I think your nephew will love the card he think it's really.